The Rebor collection of superb, prehistoric animal models, including a 1:35 scale Yutyrannus (Y. huali) (Y-REX) and the 1:35 scale Tyrannosaurus rex dinosaur models. A range of beautiful Rebor dinosaurs, hand-painted prehistoric animal figures for the discerning collector or enthusiastic dinosaur fan. Rebor uses state-of-the-art modelling techniques to produce fantastically detailed figures, many with articulated lower jaws. Each model is cast as a single piece, hence no seams to ruin the detailing of the replica and each prehistoric animal figure is based on the latest scientific research. Dinosaur model collectors also viewed: Bullyland Dinosaurs a collection of prehistoric animal models made by Bullyland of Germany. Buy Rebor dinosaurs and prehistoric animal models on line. Everything Dinosaur stocks a huge range of Rebor prehistoric animal replicas and Rebor dinosaur models. The Rebor range is a fantastic collection of highly collectable figures and replicas. For further information, dinosaur data, tips and advice on dinosaur model collecting or any other product within the extensive Everything Dinosaur range such as Papo Models or to find out more details about Rebor dinosaurs, contact our office team via email. A wonderful, museum quality model of the dinosaur Compsognathus by Rebor. The Rebor 1:6 scale Compsognathus (Sentry) complete with dragonfly model. The Rebor Sentry Compsognathus has an articulated lower jaw. A fantastic 1:35 scale replica of the fearsome Ceratosaurus. A superb edition to the Rebor model collection a Ceratosaurus dentisulcatus. A Rebor Club Selection hatchling Stegosaurus replica. A limited edition (only 1,000 made), hatching Stegosaurus by Rebor. Say hello to the Rebor Club Selection "Clover". A Rebor hatchling stegosaurus model. A superb 1:35 scale replica of Ankylosaurus (War Pig) with a Mountain colour scheme. A spectacular Rebor War Pig Ankylosaurus. A superb 1:35 scale replica of Ankylosaurus (War Pig) with a Woodland colour scheme. A spectacular Rebor War Pig Ankylosaurus. The first replica in the Rebor prehistoric animal model collection. This superb, highly detailed, 1:35 scale model of the Tyrannosaur called Yutyrannus huali. A fantastic collectors piece. The Rebor Scout series baby Velociraptor dinosaur model (Stan). A 1:18 scale model of a baby Velociraptor by Rebor. A spectacular Velociraptor dinosaur model from Rebor. The 1:18 scale Velociraptor (Pete). An amazing 1:18 scale Velociraptor model by Rebor. The Rebor 1:18 scale Velociraptor (Spring-heeled Jack). A Rebor 1:35 scale Tyrannosaurus rex Killer Queen jungle. An amazing Rebor 1:35 scale T. rex Killer Queen jungle. A Rebor 1:35 scale Tyrannosaurus rex Killer Queen plain. An amazing Rebor 1:35 scale T. rex Killer Queen plain. 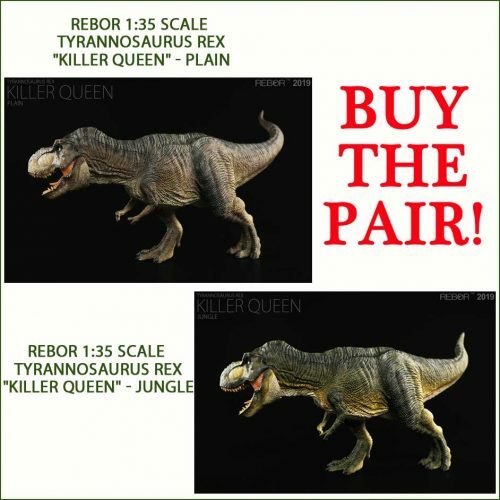 Buy the pair of Rebor Killer Queen T. rex figures - plain and jungle. Two amazing Tyrannosaurus rex figures from Rebor (plain and jungle). A fantastic 1:35 scale replica of a Tyrannosaur by Rebor. The Rebor "Vanilla Ice" Tyrannosaur figure in the jungle colour scheme. A spectacular 1:35 scale Tyrannosaur figure by Rebor. A superb 1:35 scale replica of a Tyrannosaur by Rebor. The Rebor "Vanilla Ice" Tyrannosaur figure in the mountain colour scheme. A spectacular 1:35 scale Tyrannosaur figure by Rebor. The Rebor Scout series baby Triceratops dinosaur model (Hazelnut). A 1:35 scale model of a baby Triceratops by Rebor. Rebor dinosaur models and prehistoric animal scale replicas to buy on line from Everything Dinosaur. A range of hand-painted, realistic, beautiful, scale models of prehistoric animals and dinosaurs including many 1:35 scale dinosaur models. All named prehistoric animal replicas and models in the Rebor collection are supplied with their very own fact sheet written by the experts at Everything Dinosaur so you can read all about dinosaurs, marine reptiles and other creatures from the past. These fantastic replicas are a must for collectors. These prehistoric animals and Rebor dinosaur models are great display pieces. Customers who visited these pages looking for Rebor dinosaurs also checked out: Collecta Scale Prehistoric Animals to view more scale models of prehistoric animals.